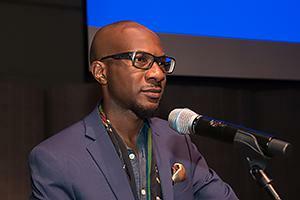 Teju Cole is a photography critic for the New York Times Magazine. Last week, he made a special two-day appearance at AU. How do you practice art in the 21st century? That question would likely provoke considerable disagreement. But Teju Cole’s creative depth and talent across platforms make him a contemporary model to behold. Cole has published novels, nonfiction essays, and a photography book. Media outlets have praised his innovative use of social media, and his output includes everything from art installations to Spotify playlists. He’s also a photography critic for the New York Times Magazine. Cole made a special two-day appearance at American University on Wednesday, October 3, and Thursday, October 4. After his first presentation in the McKinley Building, Cole talked about art and activism as part of the College of Arts and Science’s Bishop McCabe Lecture Series. The sold-out, Thursday evening event took place in the Katzen Arts Center’s Abramson Family Recital Hall. Numerous partners brought Cole to AU, including CAS, the School of Communication, the Humanities Lab, the MFA Creative Writing Visiting Writers Series, the Studio Art Program, and the Literature Department. The event was based on his book, Known and Strange Things, with Cole sharing slides of other artists’ photos that he’s analyzed through written essays. He discussed the built-in racial biases of the photography world, while noting how seminal artists resisted those confines. For example, Roy DeCarava depicted the lives of African Americans, and he often made the shadings of his pictures a bit darker. He wrestled with how to depict conflict, sometimes preferring images of objects instead of the people being brutalized. He showed one photo of the blouse of a school girl who was abducted by Boko Haram in Nigeria. He mentioned the all-too-frequent ritual of seeing black lives taken. Referencing his “Death in the Browser Tab” essay, he recalled watching a video of South Carolinian Walter Scott’s death spontaneously auto-play on the New York Times homepage. He subsequently traveled to that same South Carolina area—not to interview anyone, but to get a feel for where Scott was killed. The photo was taken in 1960, just as the Brazilian city was becoming a major metropolis. Cole became obsessed with where exactly this rooftop was located, and he spent days in São Paulo asking people about it. “It was just sort of maddening that I couldn’t find it, and also maddening that I cared so much. Why did it matter?” he asked. Through some photo detective work, he eventually found the building before contemplating a more profound discovery. In dissecting the strange alchemy of the medium, he noted how it can also inspire. He was disillusioned after the 2016 presidential election, but Taryn Simon’s image of a floral arrangement helped revive his passion. Simon inventively isolated flowers that usually remain on a table beneath smiling heads of state during diplomatic summits. “I’m very grateful to this piece, because it was just a way for me to get back to life. It kind of saved me, in a way,” he said. Cole delved into the process of writing about these photos. One fascinating anecdote involved the now-classic photo of a Black Lives Matter protestor, standing in near-Zen tranquility, while two Robocop-looking Louisiana State Police officers approach her. “I wanted to think about it in connection to something like ‘Tank Man,’ and just the way that individual people’s moments of tremendous courage can be captured by photography,” he recounted. But just after he’d written a draft of the piece, a man shot and killed a few Baton Rouge police officers. The political climate shifted dramatically, and he considered whether he should reframe the piece. After arguing with his editors, he decided to keep his essay as originally written, and he just added another page. “The duty of critical writing is to listen to the noise of the world, without being deafened by it,” he said. Throughout the evening, Cole expressed ambivalence about how we digest daily violence. He argued that news organizations won’t photograph white people getting killed, and he called for more racial and geographic balance when showing victimization. “If we’re committed to saying, ‘Well, it’s important, it should be seen,’ then it should be important enough that it can be seen regardless of who it is,” Cole said during the question-and-answer session. In response to a question about a museum on genocide in Cambodia, Cole favored documenting large-scale atrocities. Even with his discomfort, he leans toward keeping the cameras rolling and active. And near the end of the conversation, he affirmed every artist’s role in the world.